The immigration authorities of Canada held the second round of invitations of the Express Entry in 2018 where 2,750 candidates received Invitations to Apply for Canada permanent residence covering all programs. The lowest CRS score to enter was 444, which was two points below the score of the previous draw. IRCC used the new format for conducting this draw. With these changes, immigration authorities are now permitted, to arrive at the exact number of invitations, meant to be issued. When the number of candidates having the lowest score, exceed the number of invitations, to be issued, officials implement a tie-breaking mechanism, for issuing invitations, considering the date and time, which is stamped on the application. When many candidates have the same low score, the cut-off threshold is arrived, as per the date and time of submitting the profiles in Express Entry. The new format permits the officials, to have a control, to implement a finer method, for selecting the given number of candidates, to receive an ITA. This provision was not allowed in the previous system. Considering the recent change, the draw continued with the trend in the Express Entry System, where the lowest CRS score was under 500. 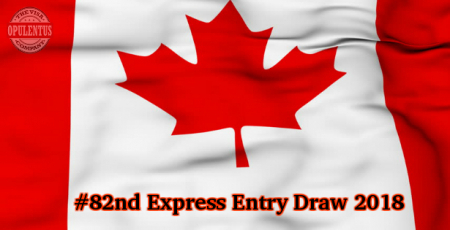 Express Entry was the immigration system introduced by IRCC on January 1st, 2015. It manages the applications of skilled workers under Federal Economic programs. The programs are some Provincial Nomination Programs apart from the Skilled Trades Program, the Federal Skilled Worker Program, and the Canada Experience Class. All the Stakeholders can expect to witness around 30 draws where up to 70,000 invitations will be issued in the year - 2018, the draws are likely to feature CRS scores below the mark of 450 so that the Canadian immigration authorities meet the targets allotted in for annual immigration in 2018. This means that the Employers need to consider obtaining LMIA/nomination under PNP for ensuring lasting retention of employees. We provide guidance to all interested candidates to Migrate to Canada in a short time. Candidates must note that the majority of aspirants, receiving ITA’s under Express Entry system, need a CRS score which is less than 450 points. This will allow many applicants to receive admission to Canada, without having a job offer or provincial nomination.